The yacht features 3 double cabins for guests with large powerful fans and opening hatches providing good ventilation throughout the yacht. 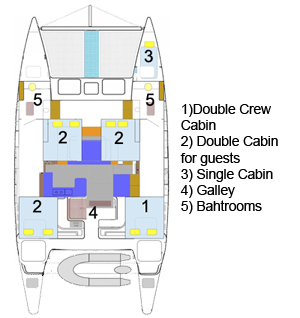 The cabin are segregated for privacy by sliding curtains and forward are two large toilet / shower units, one in each hull as well as a further two showers on the aft decks, ideal for a freshwater rinse off after enjoying a swim. The spacious saloon has wrap around seating with plenty of space for six people to dine in comfort while lunches are often taken Al Fresco in the cockpit where we have a removable table which can also cater for up to six guests. Forward, the yacht has a sizable lounging area on her extensive trampolines where our guests can relax and enjoy their surroundings. Bean bags and a large awning makes this the most popular spot on the yacht. There are many things on a sailing cruise with us which are beyond mere words, but you will be in the hands of an experienced and friendly crew who take pleasure in making sure your trip with us is a relaxing and memorable holiday.